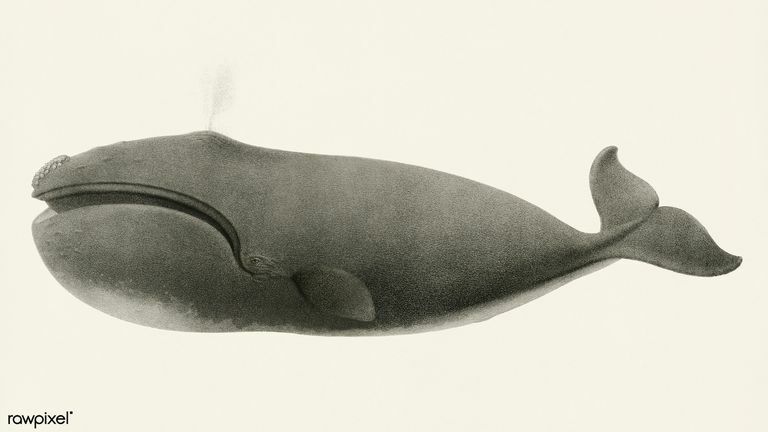 Northern Pacific Right Whale (Eubalaena japonica) from 1872 Natural History of the Cetaceans of Western Coast North America by Charles Melville Scammon (1825-1911). 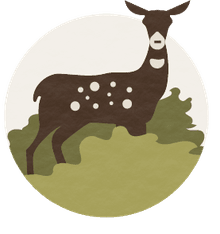 Biodiversity Heritage Library. Digitally enhanced by rawpixel. The North Pacific right whale is a critically endangered species. Along with the North Atlantic right whale and the southern right whale, the North Pacific right whale is one of three species of living right whales in the world. All three species of right whale are similar in appearance; their genetic pools are distinct, but they are otherwise indistinguishable. North Pacific right whales are robust, with a thick blubber layer and a girth sometimes exceeding 60 percent of their body length. Their bodies are black with irregular patches of white, and their flippers are large, broad and blunt. Their tail flukes are very broad (up to 50 percent of their body length), black, deeply notched, and smoothly tapered. Female right whales give birth once every 2 to 3 years, starting around age 9 or 10. The oldest known right whale was a female who lived at least 70 years. Calves are 15–20 ft (4.5–6 m) long at birth. Adult right whales range between 42–52 ft (13–16 m) in length on average, but they can reach over 60 ft (18 m). They weigh over 100 metric tons. About one-fourth to one-third of a right whale's total body length is the head. The lower jaw has a very pronounced curve and the upper jaw has 200–270 baleen plates, each narrow and between 2–2.8 meters long, with fine fringing hair. Whales are born with patchy irregular spots, called callosities, on their faces, lower lips, and chin, above the eyes and around the blowholes. The callosities are made of keratinized tissue. By the time a whale is several months old, its callosities are inhabited by "whale lice": small crustaceans who clean and eat algae off the whale's body. Each whale has an estimated 7,500 whale lice. North Pacific right whales are among the most endangered whale species in the world. Two stocks are known to exist: western and eastern. The western North Pacific right whale lives in the Sea of Okhotsk and along the western Pacific rim; scientists estimate there are about 300 of them left. The eastern North Pacific right whales are found in the eastern Bering Sea. Their current population is believed to be between 25 and 50, which might be too small to ensure its persistence. North Pacific right whales migrate seasonally. They travel northward in spring to high-latitude summer feeding grounds, and southward in fall for breeding and calving. In the past, these whales could be found from Japan and northern Mexico northward to the Sea of Okhotsk, the Bering Sea and the Gulf of Alaska; today, however, they are rare. North Pacific right whales are baleen whales, meaning that they use baleen (toothlike bone plates) to filter out their prey from sea water. They forage almost exclusively on zooplankton, tiny animals that are weak swimmers and prefer to drift with the current in massive groups. North Pacific right whales prefer large calanoid copepods—are crustaceans about the size of a grain of rice—but they will also eat krill and larval barnacles. They consume whatever gets picked up by the baleen. Feeding takes place in the spring. In higher latitude feeding grounds, North Pacific right whales locate large surface patches of zooplankton, then swim slowly (about 3 miles per hour) through the patches with their mouths wide open. Each whale needs between 400,000 and 4.1 million calories each day, and when the patches are dense (about 15,000 copepods per cubic meter), whales can fulfill their daily needs in three hours. Less dense patches, around 3,600 per cm3, require a whale to spend 24 hours feeding in order to meet their caloric needs. The whales will not forage on densities below 3,000 per cm3. Although most of their visible feeding takes place near the surface, the whales can dive also deeply to forage (between 200–400 meters below the surface). Scientists believe that right whales use a combination of memory, matrilineal teaching, and communication to navigate between feeding and wintering grounds. They also use an array of tactics to find plankton concentrations, relying on water temperatures, currents, and stratification to locate new patches. Right whales produce a variety of low-frequency sounds described by researchers as screams, moans, groans, belches, and pulses. The sounds are high amplitude, meaning they are detectable across long distances, and most range below 500 Hz, and some as low as 1,500–2,000 Hz. Scientists believe that these vocalizations may be contact messages, social signals, warnings or threats. Throughout the year, right whales create "surface active groups." In these groups, a lone female vocalizes a call; in response, up to 20 males surround her, vocalizing, leaping from the water, and splashing their flippers and flukes. There is little aggression or violence, nor are these behaviors necessarily connected with courtship routines. Whales only breed at certain times of the year, and females give birth in their wintering grounds nearly synchronously. Gregr, Edward J., and Kenneth O. Coyle. "The Biogeography of the North Pacific Right Whale (Eubalaena japonica)." Progress in Oceanography 80.3 (2009): 188–98. Kenney, Robert D. "Are Right Whales Starving?" Right Whale News 7.2 (2000). Širovic, Ana, et al. "North Pacific Right Whales (Eubalaena Japonica) Recorded in the Northeastern Pacific Ocean in 2013." Marine Mammal Science 31.2 (2015): 800–07.